It’s that time of year… and we’re not talking about flu season. Although this is an epidemic in its own accord. Did you know that apologies increase by over 40% on the days after Valentine’s Day? We just pulled that out of the air but it sure sounds believable! So maybe you forgot Valentine’s Day.. or maybe you remembered but forgot how to read your significant other and know what they wanted. Hey you’re not a mind reader we get it! This isn’t just for those of you failing at giving a loved one what they want, this is for anyone who’s in a hole so deep they don’t know if they are digging down or up. Introducing the Tacopology – the easiest way back to ground level. Leave the windows down on your wife’s car in the rain? Tacopology. Accidentally get your mom convicted of insurance fraud because you can’t take responsibility for your own life? Tacopology. Only like your best friend’s photo of her new dog when you really should’ve loved it? Tacopology. The uses are endless but the time is not! 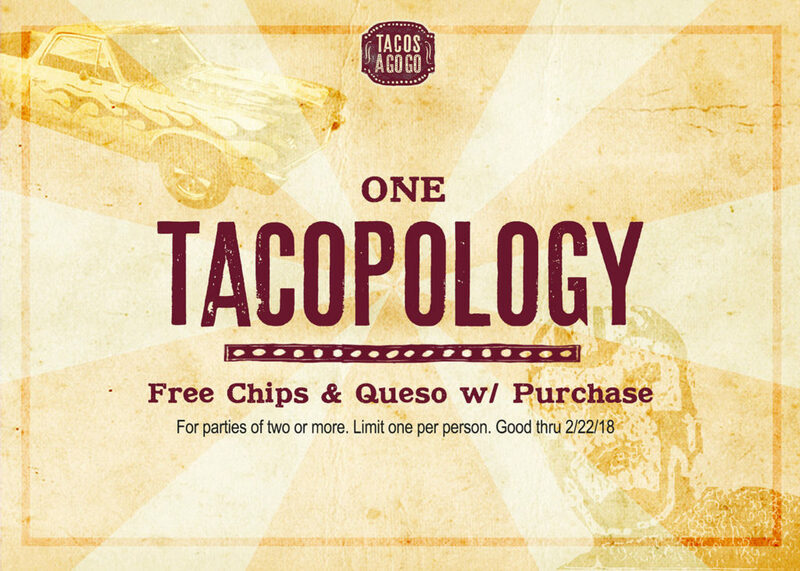 Now through February 22nd offer a Tacopology to the person you wronged and bring it in for complimentary chips and queso. Bury the hatchet or just cover it in lots and lots of queso – out of sight out of mind! 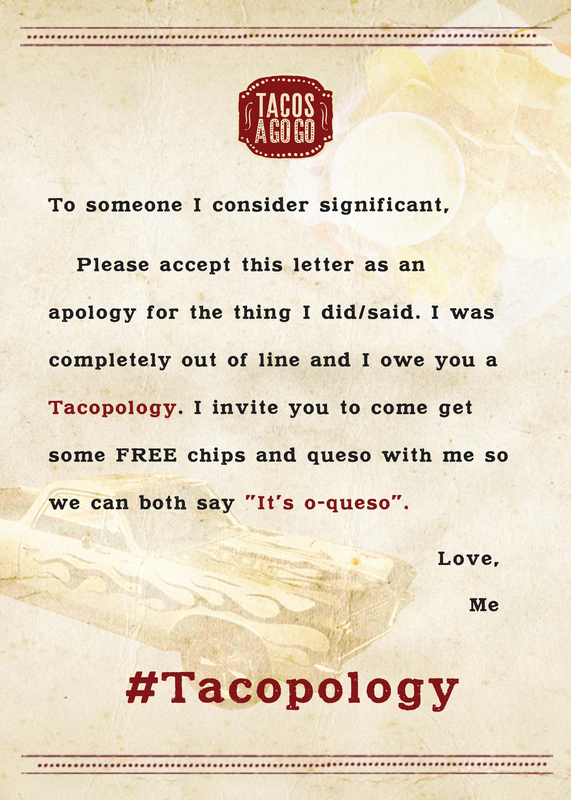 A Tacopology is only for parties of 2 or more because hey.. you don’t owe yourself an apology – you’re damn near perfect. For those needing a little extra we’ve also included a prewritten letter that you can either read or present to the person you screwed over. Or persons, if you’re in the habit of steam rolling you may just want to print off a bunch and keep them handy. Screenshot or print off the voucher to redeem! Bring in your wife, your girlfriend, or both! P.S. if you pull that off we want pictures because your family will want recent photos for your funeral. Results may vary, not valid in the state of Nevada because we don’t have stores there. 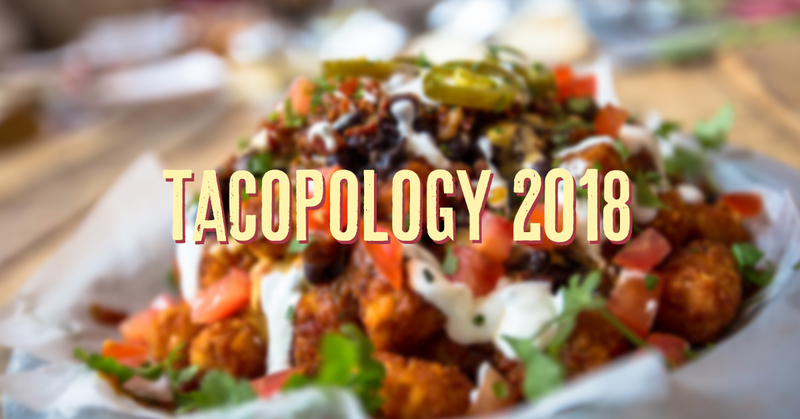 Get your Tacopology on! It’ll be o-queso!